TAGUMA, SAKAYE, 82, passed away unexpectedly yet peacefully at her West Sacramento, Calif. home on July 16, 2013. The third of seven children of a pioneer missionary of the Tenrikyo Church in America, she was born on April 20, 1931 in Sacramento, Calif. to Minoru and Fusako (Katayama) Yoshizawa. She and her family returned to Japan when Sakaye was five years old. Fiercely proud of her family’s roots in the Japan Alps of Nagano Prefecture, Sakaye and her immediate older sister Fumiko spent part of their childhood — from ages 7 to 12 — apart from the rest of their family, at a Tenrikyo Church in her hometown of Omachi, Nagano Prefecture. From age 12 to 22, she relocated to Tenri City, Nara Prefecture, with her younger sister Fujiko to initially attend school. There, she once held a job as a switchboard operator to the head of the Tenrikyo religion, the Shimbashira. Thus, from age 7 to 22, she lived apart from her parents and most of her six other siblings. In her twenties, she was arranged to be married to Noboru Taguma, the eldest son of the late Iwakichi and Iwa Taguma in the countryside of West Sacramento, Calif. Yet despite their arranged beginnings, they grew an undeniable bond of love together that lasted for more than five decades. 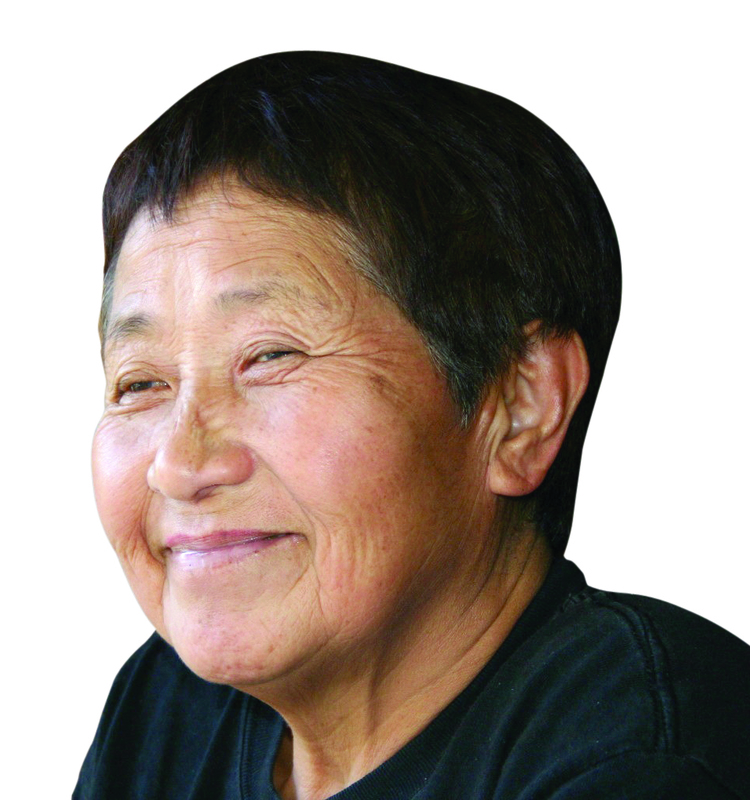 For more than three decades, she would support Noboru and his brother Goichi as they farmed tomatoes in nearby Clarksburg, Yolo County, at the same time raising five kids. She said that she purposefully didn’t learn English so that her children could learn Japanese. Sakaye and Noboru were devoted followers of the Tenrikyo Church, attending both the Tenrikyo Sacramento Church and the Tenrikyo Unity Church in Hayward, Calif. They would grow a variety of fruits, vegetables, plants and flowers around their home — including five Satsuma Mikan (tangerine) trees, a prolific lemon tree, gobo (burdock), myoga (Japanese ginger), cucumbers, Japanese eggplant, various beans, hoshigaki (dried persimmons) and the like. These were all generously given away to relatives, friends, churches and church members, their children and, at times, passersby. As her husband Noboru’s wartime resistance behind a barbed wire concentration camp became publicly known in the 1990s — through local and national newspaper articles, books on both sides of the Pacific, a segment on NHK TV in Japan, and public ceremonies — Sakaye stood by him as he finally received recognition for his wartime stand on constitutional principles. She lost her husband of 53 years on March 11, 2011, as the Great East Japan Earthquake and tsunami hit Japan. Sakaye passed away after a long and fulfilling life nurturing many along the way with her trademark generosity and faith. She is deeply missed by her children, grandchildren, and all those who she touched. Sakaye was predeceased by her parents Minoru and Fusako (Katayama) Yoshizawa, and sisters Shoko (Kazuhide) Furuhata and Himeyo (the late Hirato) Nishimaki. She is survived by daughter Masako Carol Yasue of Nagoya, Japan; son Makoto Mark (Alice) Taguma of Mountain View, Calif.; daughters Mariko Sharon (Benjamin Kam) Taguma of Union City, Calif. and Machiko Gail (Andy) Irie of Torrance, Calif.; and son Kenji Glenn Taguma of San Francisco. Surviving siblings include Fumiko (the late Ryusuke) Kasagi, Fujiko (Kaname) Nishizawa, Setsuko (Akira) Anezaki and Toshio (Toshiko) Yoshizawa. She is also survived by 10 grandchildren, numerous nieces and nephews and grandnieces/nephews, as well as a number of in-laws. Final viewing will be held on Friday, July 26, 6 to 8 p.m., at Sacramento Memorial Lawn, 6100 Stockton Blvd. in Sacramento. A memorial service will be held on Friday, Aug. 2, 1 p.m., at Sacramento Memorial Lawn, with burial to immediately follow. Reception afterward at the Tenrikyo Sacramento Church, 6361 25th St. (at 47th Ave.) in Sacramento. In lieu of flowers, contributions in her memory can be made to the Nichi Bei Foundation, P.O. Box 15693, San Francisco, CA 94115.